What is a Tagging Study? Understanding the performance and fate of individual fish helps us understand why populations fluctuate over time. Since 1997, we have studied stream fish using tags that contain unique electronic codes. We can estimate body growth, movement, and reproduction (performance), as well as survival (fate) by recapturing tagged fish over time. Our two longest-running tagging studies are the West Brook, in Whately MA and Stanley Brook in Seal Harbor, Maine. Dots on the maps are 20m-long (WB) or 40-m long (SB) sampling sections. Mouse over a section in the West Brook to see a picture of the section from 2006 (WB) or 2008 (SB). What is the scope of the fish tagging studies? 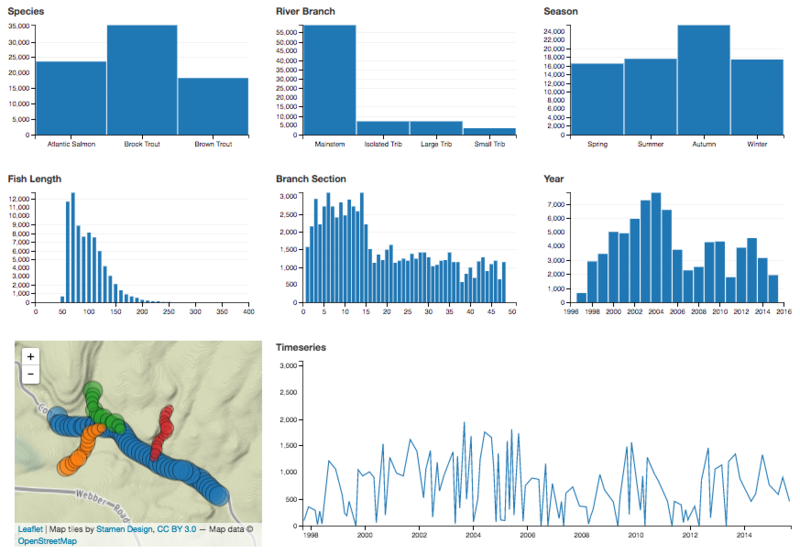 The overview visualization provides a step-by-step explanation of the basic patterns we found in the fish tagging datasets for each watershed. Through this narrative, you will learn how the number of captured fish varies between species, seasons, river branches, and year to year. 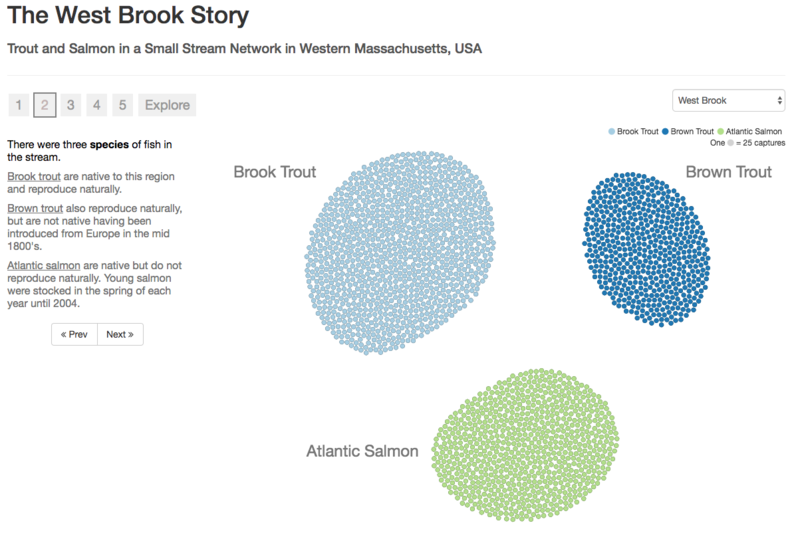 At the end, the visualization lets you explore characteristics of the dataset yourself by changing the color and grouping of bubbles representing individual fish. What are the relationships between variables? The interactive crossfilter visualization lets you slice and dice the dataset across multiple variables. Each variable is represented by a histogram showing the number of fish captured for each value. You can focus on subsets of the dataset by selecting individual categories or ranges of values among the variables, and then immediately see how the other variables respond through linked changes in the other histograms. How do individual fish move over time and space? 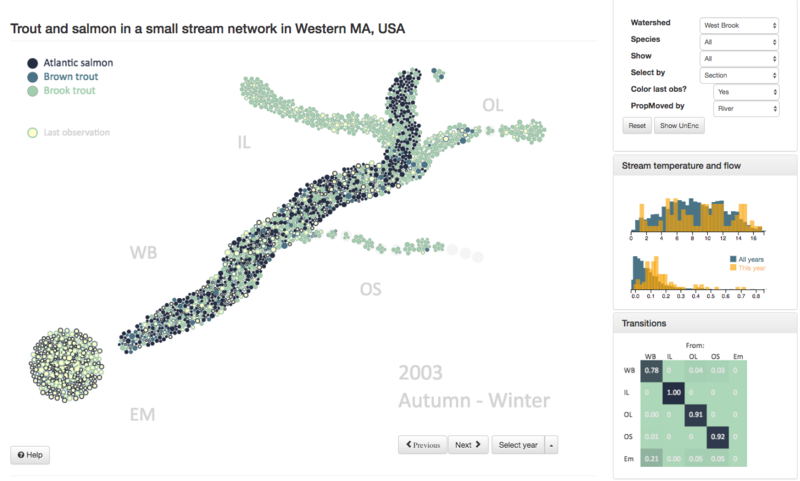 The fish movement visualization shows how individual fish move between sections of the river over time. Watch the fish from West Brook or Stanley Brook move from season to season and see who lives and dies. Individuals, all fish from a sampling section, river or even family (in some years) can be selected to see how groups of fish move around and how long they survive. Ben Letcher initiated the West Brook study in 1997 with Gabe Gries. Since then the study has been a collaboration among the USGS Conte Laboratory (Ben Letcher, Matt O'Donnell, Todd Dubreuil), the USFS Northern Research Station (Keith Nislow, Jason Coombs), and the University of Massachusetts Department of Environmental Conservation (Andrew Whiteley - now at The University of Montana). Ben Letcher and Matt O'Donnell started the Stanley Brook study in 2006 with Joe Zydlewski from the University of Maine and Bruce Connery of the National Park Service . We thank the many graduate students, interns, post-docs and others who have helped sample the streams over the years. The web site and data visualizations were developed by Ben Letcher and Jeff Walker.